His biography came my way by boredom. I'd bought the most recent Koontz novel and to my deep disappointment, I was finished it in two days. It was a very fine novel. But it did not satisfy over the days. So I went to the library. 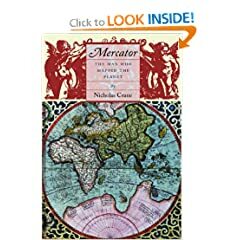 One of the books I picked up is "Mercator: The Man Wo Mapped The Planet" by Nicholas Crane. The book gives a rich description of life and society of the 1500's. The story is extensive, too, because like so few of his time, Mercator lived to be over eighty years old. What strikes me is that a bad winter or a poor harvest could send the people in to a spiral of poverty and starvation so very, very quickly. I am at the part of the story where Mercator is in his fifties. He has just lost a grandson, his daughter, and one of his sons to the plague. His contemporaries are passing from kidney stones, an accidental splinter of jousting pole to the brain, gout, stroke, and heart attack. Familiar to our times, the series of disasters and political events have many convinced that armageddon is at hand. All the signs are abundant. So, as my earlier readings of medieval times have led me, people are no different today. We react the same way to dire events. There is love, dignity, fear, and prejudice in abundance. What is different today is the strength of our administration, civilization, health care, and the devising of social safety nets. Can you imagine today, when a financial crisis looms, that we be faced with lines of migrants leaving our city, emaciated, munching on grasses and barks to stave off death? Not that we take the needs of the poor for granted. Oh, no. But we have come a long way. There are ways to prepare for social crises. We've learned something from our histories. Like Joseph of old, our leaders should store up during the seven fat years of abundance, for what may lay ahead. What room in my home is my favorite?